It lay in the mettle of the men themselves. To be the sort of man who would give way when his mates were trusting to his firmness … to live the rest of his life haunted by the knowledge that he had set his hand to a soldier’s task and had lacked the grit to carry it through — that was the prospect these men could not face. Life was very dear, but life was not worth living unless they could be true to their idea of Australian manhood. On 25 April 1915, 16,000 Australian and New Zealand troops landed at what became known as Anzac Cove as part of a campaign to capture the Gallipoli Peninsula. The British had been trying to force their way through the narrow straits known as the Dardanelles to capture Constantinople and so relieve pressure on their Russian allies engaged with Ottoman forces in the Caucasus. Minefields and on-shore artillery batteries thwarted the early naval attempts to seize the strait and it was decided that troops would have to be landed on the peninsula to overcome Turkish defences. 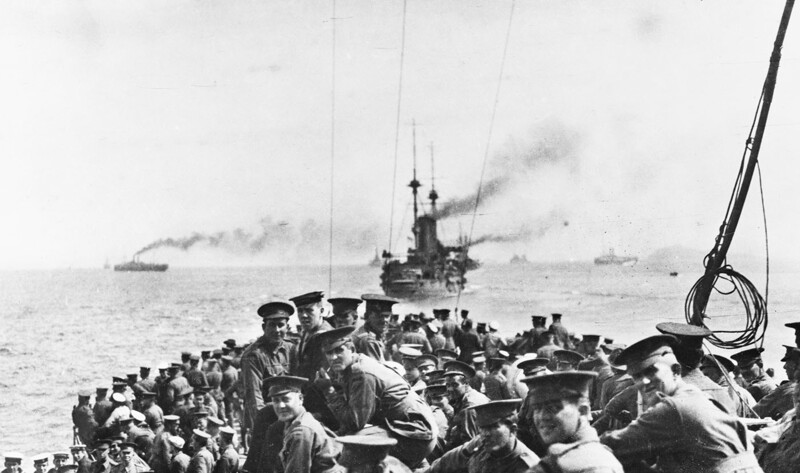 British and French forces landed at Cape Helles on the southern tip of the peninsula. Meanwhile, the Australian and New Zealand Army Corps (ANZAC), which included the 1st, 2nd, 3rd, and 4th Australian Brigades along with the 1st New Zealand Brigade as well as artillery units from the British Indian Army, landed on the west coast in a series of waves. However, in the early morning darkness it is possible that they were beached one kilometre or so north of their planned objective in an area of steep, rugged terrain. Once on the beach, many units became separated from one another as they began moving up the tangle of complex spurs and ravines in the darkness. Turkish resistance remained strong, and the Anzacs were subjected to devastating artillery bombardments. By mid-morning Turkish reinforcements had arrived under Mustapha Kemal (later Kemal Ataturk, president of Turkey). Kemal’s orders to his men are said to have been: ‘I don't order you to fight, I order you to die. In the time it takes us to die, other troops and commanders can come and take our places’. The Anzac position became progressively more precarious as the Anzacs failed to secure their high-ground objectives. The Turks mounted a fierce counter-attack regaining much of the ground the Anzacs had taken. That evening, Major-General William Bridges, commander of the 1st Australian Division, and Lieutenant-General Sir William Birdwood, commander of ANZAC, both advised General Sir Ian Hamilton, Commander-in-Chief of the Mediterranean Expeditionary Force, that the Allied force be withdrawn from the peninsula. After consultation with the Royal Navy, Hamilton decided against an evacuation, and ordered the troops to dig in. Falling back on improvised and shallow entrenchments, the Anzacs held on for a crucial first night. By that first evening 16,000 men had been landed but more than 2000 had been killed or wounded. For the next eight months, the Australians advanced no further than the positions they had taken on the first day. The British and French forces farther south were also unable to break out of their positions. By November, with more Turkish reinforcements and German equipment in place, it was obvious the stalemate would continue. Lord Kitchener, the British chief of staff, visited the peninsula and recommended to the British Cabinet that a general evacuation take place. In late December, the Anzacs were successfully evacuated with barely any casualties, and by 20 January 1916 all Allied troops had withdrawn from the peninsula. The landings at Anzac Cove were the first foray into battle of the Australian Imperial Force. Australia was only 14 years old, and this was the first time it had fought as a distinct nation. The Gallipoli campaign was a military failure but the characteristics that the Anzacs displayed throughout the campaign — bravery, ingenuity, endurance and mateship — have come to be celebrated as defining characteristics of the Australian personality.